There is a very interesting website up from Globaia that maps the anthropocene. There is some nice background info, part of which is below. The images are especially intriguing. 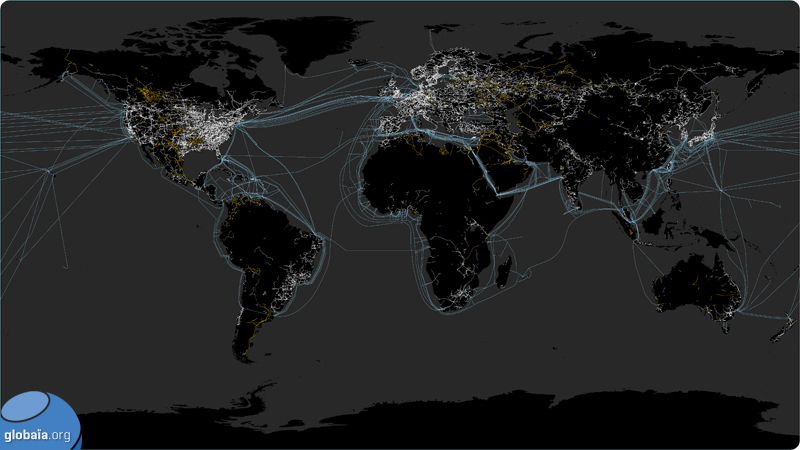 This one is of pipelines, energy transmission lines and and submarine cables, the rest are here). The Anthropocene. We’re already there. This is our time, our creation, our challenge. Officially, this epoch does not exist. Yet. It may be added permanently to the geologic time scale in 2016. It is the International Commission on Stratigraphy that determines the denomination and the calibration of different divisions and subdivisions of geological time, which date back to the formation of the Earth, 4.6 billion years ago. Unofficially however, the term is used more frequently in the scientific literature and, more recently, in publications dedicated to the general public. So, might you ask, what is the Anthropocene? First, the etymology. The Ancient Greek [anthropos] means “human being” while [kainos] means “new, current.” The Anthropocene would thus be best defined as the new human-dominated period of the Earth’s history. Technically, the Anthropocene is the most recent period of the Quaternary, succeding to the Holocene. The Quaternary is a period of the Earth’s history characterized by numerous and cyclical glaciations, starting 2,588,000 years ago (2.588 Ma). The Quaternary is divided into three epochs: the Pleistocene, the Holocene, and now the Anthropocene….READ MORE HERE. Mapping the Anthropocene – some striking images. As others have pointed out, this includes some striking images. But I am also taken by the title, which uses a word now generally thought to be falling out of favor: “cartography.” Perhaps it’s because I’m rereading Larsen’s T.S. Spivet book about a 12-year old cartographer, but it raises the question of who is a cartographer, and what does it mean to be one? There’s a somewhat traditional craftsmanship ring to it, as if it were a guild to which one could train and hone skills. (When I took cartography classes in the 1980s we indeed had to learn manual, even artisanal skills such as scribing and photography.) On the other hand, that impression also suggests a genuineness that does not (yet) circulate around say “GIS” much less “GI Science” or “geospatial information science and technologies” (GIS&T). Perhaps “mapping” would be a compromise halfway between them. By placing cartography with a word coined by an atmospheric scientist however, ie anthropocene, we also evoke another aspect of cartography; that of the “arts” (L. ars) as skill or mastery, especially of the technical (surveying equipment, plotting, scale and projections etc.). So it’s a good reminder that cartography is the art and science of mapping, when we too often think of it only as the science.